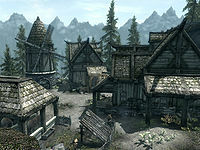 Katla's Farm is a small farm and stable along the Karth River, outside of Solitude. The farm is owned by Katla, who lives here with her husband Snilling, and their son Knud. The Hearthfire add-on adds a straw bed to the stables and a child named Blaise who works on the farm. The northern part of the farm is Solitude Stables. The farm also boast a mill. There are numerous sacks in piles around the farm. The crops are grown in two patches, one by the front door and the other behind the building. There is a wood chopping block under a roofed area to the right of the front door. The farm is not locked during the day, if you have sold crops to Katla, you will be able to enter without any issues. On your left as you enter is a barrel of foodstuffs and a basket containing cabbages and potatoes. To the right of these against the north wall is a set of shelves containing several cheese wheels and wedges, along with a cabbage and five potatoes. Against the east wall is a table holding two bottles of alto wine, one bottle of wine, a baked potato, a raw rabbit leg, several loaves of bread, two potatoes, a portion of grilled leeks, several goat cheese pieces, a seared slaughterfish and a salmon steak. Under the table is an open crate containing a sample of fly amanita, a gourd, a rock warbler egg and an orange dartwing. To the right is a fireplace with a cooking pot in front and two bottles of wine on the mantle above. On the hearth is a piece of raw beef and a cabbage in a cast iron pot. There is a small wooden table set for two in the middle of the room holding a bottle of Nord mead, a bottle of Alto wine, two portions grilled leeks, two seared slaughterfish, a loaf of bread, an eidar cheese wedge and a bulb of garlic. Coming out from the east wall, to the right of the fireplace is an internal wall with an open crate against it containing five red apples, three potatoes and two cabbages. Against the west wall are two open crates containing three leeks, two potatoes, a cabbage, four tomatoes and three garlic bulbs. Hanging from the ceiling are five garlic braids. The stair up to the top floor are also against the west wall. Behind the internal half-height wall is Katla and Snilling's bedroom containing an unowned double bed in the middle of the south wall with and end table to the left holding a bottle of wine and a stool to the right. Above the bed is a wall shelf holding two bottles of wine, one bottle of alto wine and three bottles of Nord mead. Against the internal wall is a cupboard holding a set of fine clothes, a pair of boots, three garlic bulbs and a gourd. To the right against the east wall is another cupboard holding a knapsack] a woodcutter's axe and an iron mace. Under the stairs are two sets of shelves containing a potion of regeneration, three bottles of Nord mead, a bottle of wine, two sheaves of wheat, two loaves of bread, three carrots, potatoes and cabbages as well as several cheese wheels. At the top of the stairs against the south wall is a small set of shelves holding a woodcutter's axe. In the southeastern corner is a small round wooden table and chair. On the table is a bottle of wine, a bottle of alto wine and a loaf of bread. Against the east wall, by a doorway to another bedroom is a small unit holding a horker tusk, a cave bear pelt, a red mountain flower and a basket containing two bunches of lavender, with a sack beside it. 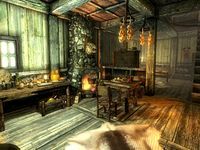 Through the doorway into Knud's bedroom, on your left is an unlocked chest, and against the west wall a table holding a bottle of wine, a bottle of alto wine, a banded iron shield, an iron helmet, a hunting bow, a steel mace, an iron war axe and a random sword. Under the table is a small coin purse. In the northeastern corner is an unowned single bed, with an end table to the left holding a common book. The key to the farmhouse is carried by Katla, Knud, and Snilling. If you sell leeks, potatoes, or wheat to Katla, the horses in the stable become free to take. However, you will not own them and they will walk back to the stable once you dismount. Also, the bed in the farmhouse becomes free to sleep in. If you buy a horse from Katla's Farm and the horse is killed, attempting to purchase a new horse from the same stable results in 1000 gold being deducted, and Geimund stating that your horse is "the one with the saddle", despite no saddled horse appearing at Katla's Farm. Instead, the new horse spawns at the Riften Stables. Travel there and mount your new horse. Esta página foi modificada pela última vez à(s) 17h23min de 28 de março de 2014.